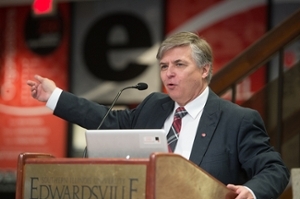 Southern Illinois University Edwardsville Chancellor Randy Pembrook, along with SIUE Emeritus English Professor Eugene B. Redmond, participated in the University’s Black Heritage Month closing ceremony on Tuesday, Feb. 28. Pembrook reiterated the University’s commitment to diversity and expressed the importance of the contributions of black people at SIUE and throughout the country. 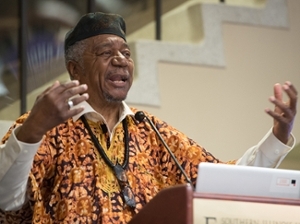 Redmond, poet laureate of East St. Louis and editor of Drumvoices Revue, recited some of his original work and talked about the vast impact of the black diaspora the world over. Ta’Nia Jordan, chair of the Black Heritage Month Committee, displayed her painting at the celebration, which was sponsored by the Campus Activities Board (CAB). 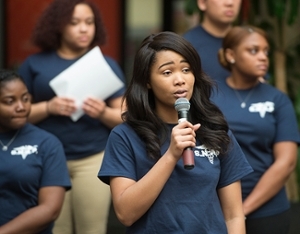 On Feb. 27, the Student Nursing Association (SNAP) at SIUE and CAB hosted “Deeper Than Just Color: A Privilege Exercise.” Participants took a step forward or backward depending upon their answer to the questions asked. 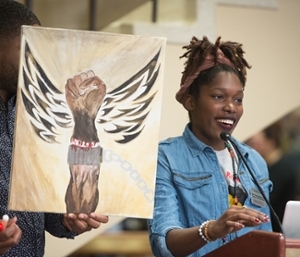 Ta’Nia Jordan, chair of the Black Heritage Month Committee, talks about her painting. Student Nursing Association (SNAP) President Danielle Lee addresses the crowd.